Authentically Jamaican. 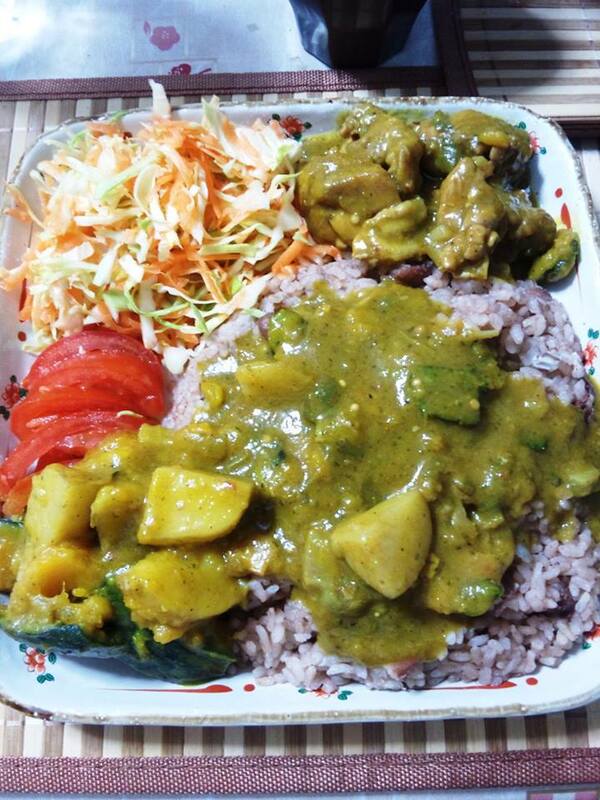 Sheldon Morgan’s Curry Chicken, Pumpkin/Alu Takari with Rice and Peas! The Unknown Cook community loves food. It’s just what we do. We are in love with our craft and we want the world to know it. And this statement couldn’t be a more accurate description of Jamaican native, Sheldon Morgan. When we saw one of Sheldon’s food postings to his own page, we knew that he was some kind of special. But what we didn’t know at the time is that he lives in Japan. Now we around here at the Cook aren’t about envy. However, to be a master of authentic Jamaican cuisine and live in one of the most beautiful places in the world does make that “e” word cross the mind. 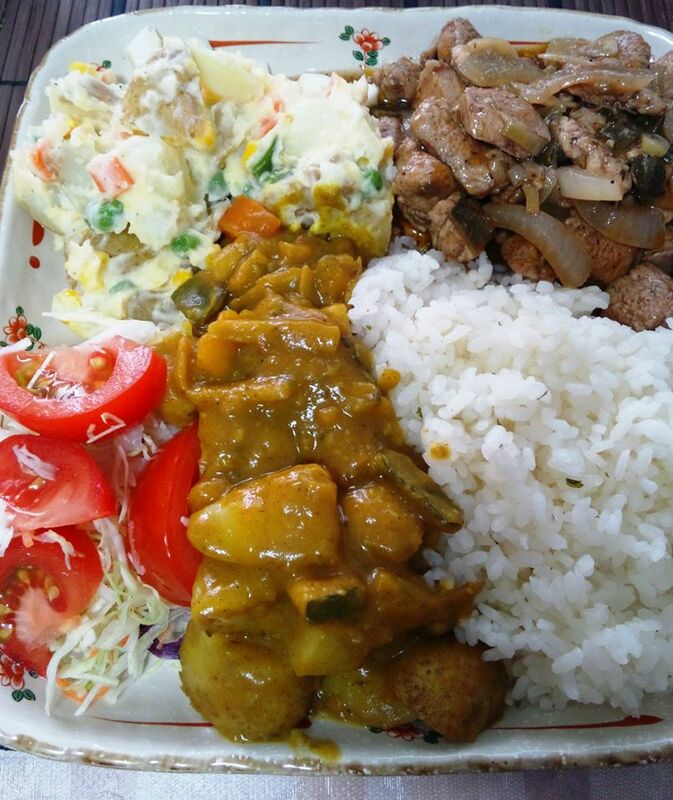 The Unknown Cook was enamored with the colors of this dish. Looks too good to eat! When he is not in the kitchen constructing some of the most attractive, mouth watering dishes we have laid our eyes on, Sheldon is teaching English at Morgan’s English Workshop in Japan. This ESL (English as a Second Language) program is designed for students of all levels from kindergarten to senior citizens. There is a great appreciation from the students of this highly successful workshop. When their classes conclude, students are able to speak English fluently and can effectively apply their second language whenever the need arises. 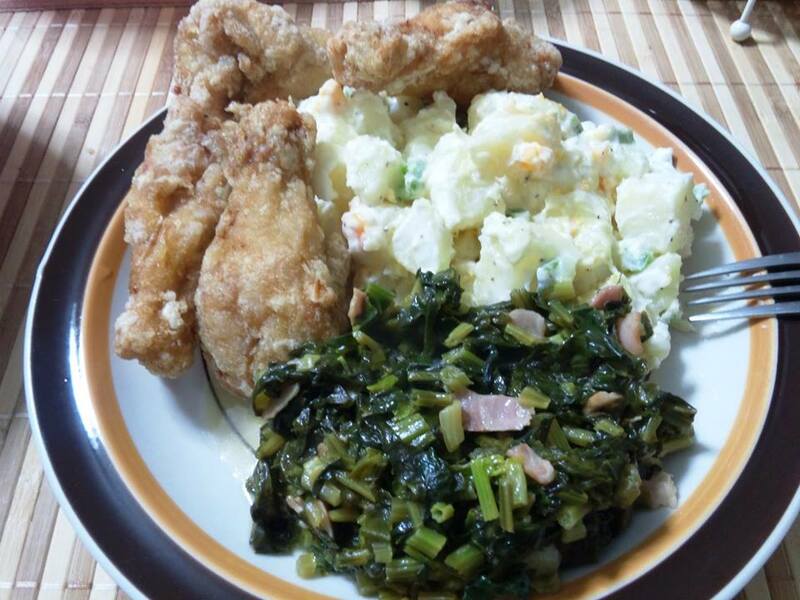 Potato Pepper Salad, Callaloo, and Chicken Drummettes. Sheldon is not only a teacher of the English language. He is also a teacher of the Bible. His immensely popular blog, Epignosis Ministries International, which can be translated to 56 different languages right from the site, has touched and changed the lives of many people around the world. With readership in over 178 countries, Sheldon’s unique and unobstructed perspective of God’s Word gives readers a clear understanding of the Bible. This blog is a must read for anyone seeking answers to spiritual intelligence. To find out more about Sheldon’s splendid dishes, his English workshop, or Epignosis Ministries International, feel free to contact him through his blog by clicking on the highlighted link above. Posted on July 21, 2014, in Uncategorized and tagged Ackee, articles on cooking, barbecue chicken, chicken recipes, cooking show, curry, curry chicken, english workshop, ESL, fried fish, grilled fish, Jamaica, Jamaican, Jamaican cuisine, Jamaican food, Japan, Japanese, japanese cuisine, salads, Salt Pork, steaks, Teriyaki chicken, unknown cook. Bookmark the permalink. Leave a comment.